Bates is proud to recognize the achievements and volunteer contributions of our alumni, parents, and friends through a program of awards and honors. Below you can learn about these awards and about the Bates people who have made this college — and the world — better through their time, efforts, and talents. The Benjamin E. Mays Medal award was established during Mays’ lifetime, and he was the inaugural recipient of the award in 1982. 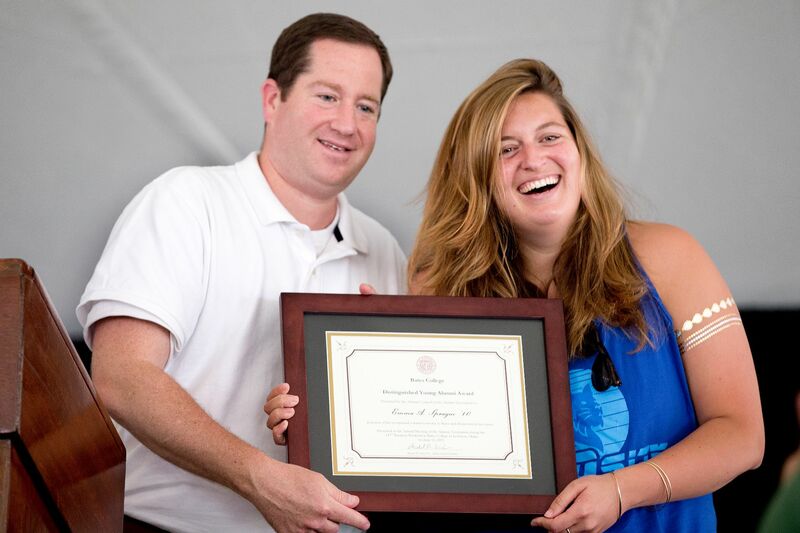 This is the highest alumni award of the college to honor an alumna or alumnus who has performed distinguished service to the larger (worldwide) community and been deemed a Bates College graduate of outstanding accomplishment. It is an occasional award that has been made only 16 times. Each year, the Office of Admission presents the David G. Russell ’66 Award to exemplary Alumni in Admission volunteers. Usually presented during Back to Bates: Homecoming & Family Weekend or Reunion Weekend, the David G. Russell Award is named in honor of the late Hartford, Conn., chairperson. David was devoted to the AIA program, and this award is intended to celebrate those in AIA who embody his same loyalty to Bates. The Bates Scholar-Athlete Society honors dedication to excellence in scholarship and sportsmanship. It celebrates the ways in which the game fits into the overall collegiate experience by honoring those who do it best.